Amidst all the bits and pieces of F1 news this week, Force India's unveiling of their new livery, another possible buyer for Super Aguri and Kimi revelling in the speed of the Ferrari F108, GrandPrix dot com has the story that may mean the most for F1's future. Doubts have already been expressed regarding Champ Cars' ability to continue; now it seems that agreement has been reached between the owners and Tony George, Indycar supremo, for a merger of the two American open wheel series. All I can say is, "Congratulations, Bernie, on missing the best chance F1 ever had of making an impact on the States." Instead of capitalizing on the damaging rift between the American series, Ecclestone kept his eye on short term profit and succeeded only in losing the USGP. Now the window of opportunity closes and F1 will find it much more difficult to regain a toehold in the biggest market in the world. Bernie will have to try, of course. The manufacturers have made it plain that they were not amused when the Indy GP was taken off the calendar and pressure is mounting for a return to the States. When rumors escaped that the difference between Bernie's asking price and George's highest offer was a mere $10 million, sponsors protested that they would happily have coughed up the difference to preserve the event. This time when Bernie goes back to Tony George, it will be with begging bowl in hand. With Champ Cars and the IRL united, Tony will be negotiating from a position of such strength that F1 will have to accept whatever scraps are offered. It may even be that Bernie is told that, contrary to his previous suppositions, it is not F1 that doesn't need the States, it's the USA that doesn't want to know. Well done, Bernie; your greed has done F1 a disservice so great that it dwarfs any good work you might have done in the past. The most infuriating thing in the whole sorry mess is that Bernie was the only one who did not care about the USGP. In spite of its occasionally farcical exhibitions in the States, F1 has managed to build a solid foundation of American enthusiast support, the manufacturer teams are aware of how important it is to their sales to have a race in America and even Tony George did his utmost to keep the GP. Bernie's crass inability to accept that some races are worth making a loss on has demonstrated his unsuitability to continue as the man who decides who gets a race and who doesn't. It is debatable anyway that such decisions should be at the behest of one man only. While Bernie has been instrumental in building the sport into the multi-million dollar enterprise it now is, we should not lose sight of the fact that it is not just a money-making exercise. There are plenty of sports that do not make a profit and are paid for by the enthusiasm and dedication of their participants and audience. Making a profit is merely frosting on the cake of a genuinely popular sport. With Silverstone getting its annual Bernie bashing at the moment and now the Australian GP coming in for the same treatment, those who care about the sport must be asking themselves whether the fate of F1 is in the wrong hands. General consensus is that Max Mosley has long overstayed his welcome and it becomes clear that Bernie too is irreparably damaging the sport. When nothing is left but anodyne processions on featureless circuits in countries that can ignore the best interests of their citizens, it will be too late to realize that F1 is no more. The rot must be stopped soon or there will be nothing left to save. Indianapolis was not a great GP. In many ways it was slightly artificial but its value lay in that it took place in the heart of American motor racing. Melbourne too was not as good a venue for F1 racing as was Adelaide; but it was in Australia, a country with a long history of F1 participation. And I hardly need point out that the British GP has been one of the constants of the sport, the first of its races and a classic wherever it is held. These races are the sport and no amount of money lost from Bernie's coffers will persuade me otherwise. We live in exciting times. As F1 enthusiasts, we are witnessing more upheavals and change than ever before. The sport grapples with problems that will decide its future, however they are settled. And I really feel that the old men who brought the sport thus far are no longer relevant; they are mired in the aims and objects of yesterday, still proceeding from the same premises that made them rich and powerful, while all the time F1 heads down a road that will make it no longer a sport and not even a business, once the fans have melted away. It is time for the old men to go. Well said, Clive. It feels like every time one of the "traditional" races is dropped, part of the soul of F1 dies. What the hell does Shanghai or any of the other new racetracks have to do with the history of motor racing? Sure, Turkey has a great curve, and Shanghai and Malaysia have pretty Tilke layouts, but F1 needs to keep the links to its past to have any relevance, to old fans and new ones. Also, Bernie's insistence on removing clips on you-tube is just as short-sighted. Millions of young, new fans are being deprived of where the sport came from. Not to mention us veterans not being able to revisit the glory days. It's like a Stalinistic purge, I say! It's clear that Bernie has the inability to look back at where he came from and what the sport and the teams have given him, and only sees forward at what the sport and teems will be forced to give him. You've got enough leukre, short man with a bad hiarcut. Take the yacht out and turn off the cell phone. Your time has passed. Hear, hear, Arnet. Bernie's obsession with money has become obscene and the removal of clips from YouTube takes him into the realms of insanity. If he has not been able to think of a way of offering an alternative, what does it profit anyone to squash such an effective way of promoting the sport? He has a new toy now. Let him go play with his football club and allow F1 to move on without him. You make a good point. I, as a rule, never go to the official web-site unless I want to check out technical drawings. Nothing they offer is of any use other than regurgitated press releases. But it could be used as a platform to offer video content and he could make money off the advertising. Now why hasn't he thought of that? I have to agree with everything you have said Clive. People say what a great job Bernie has done building the sport and compare where it was to where it is today. The point though is we have no way of knowing how much better or worse a job someone else could have done. The internet is an obvious missed opportunity the F1 branded merchandise is another. That should have been released in the early 80s not in the last year or two. The teams have cornered the merchandise market and Bernie is now trying to elbow into a small gap. He is good at maximising short term profit but I don't see any signs of an obvious long term strategy. I am sure someone like Richard Branson would have done a far better job financially and far better for the sport. That is indeed the trouble with short term strategies - it isn't long before the effects of making a quick buck become known. And it seems to me now that Bernie has been very short-sighted in his strategies, often missing opportunities for longer term gain. The examples you mention are very apparent now, Steven, but the abandonment of the USGP seems such an obvious gaffe that I am almost speechless in contemplation of it. Did Bernie never hear of the CART split? Was he so myopic that he didn't realise what a monumental gift had been delivered to F1's front door? 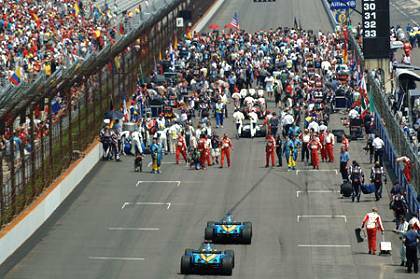 If the USGP had been handled properly over the last few years, open wheel racing would not be in the parlous state it is in the States today and it would have F1 emblazoned upon it. Okay, it still wouldn't be as big as NASCAR but what does he want - jam on it? Threats to Silverstone , Mebourne and the US fiasco and Bernie's reasons show that it really may be time for him to go ... But who would get in ? He is not elected like Max, he owns the rights. Can we end up having Tamara Ecclestone calling the shots :-) ? Actually, Wolf, I think CVC owns the rights and they employ Bernie (typical of his negotiating skills - he sells F1 and carries on doing what he's always done). The ownership by an investment company also seems at odds with the ethos of sport but I felt that was another subject and complicated the issue too much for one post. Tamara Ecclestone won't be running F1 anytime soon - last I heard, she was trying to become a beautician and craved independence from the F1 money. I would have thought that running a multi-squillion dollar empire would have spoilt any chance of fulfilling that ambition. Unfortunately, I think we're going to get a suit from CVC (F1's current owners, for whom Bernie is legally a consultant in charge of the F1 "account") in charge instead. As I understand it, CVC are worried about getting an adequate return on their investment in F1 - and so yes, they must be very happy with Bernie squeezing every last dollar from the sport. But that doesn't mean the fans have to like it - and, without them, F1 won't last very long. Well, that depends. I think that Tony George would still want an F1 race at his track. It would be the Quadruple Crown: IndyCar with the Indy 500, NASCAR with the Allstate 400, MotoGP with the Red Bull US GP, and F1. The question is: how much? Bernie, on the other hand, really doesn't care much for the US, merger or no merger. He doesn't see it as a missed opportunity, as it seems he isn't making enough money there. I guess he defines opportunities as Istanbul, Shanghai, and Bahrain. For him, that's all that matters, really. And we won't get anyone else anytime soon. Why? Bernie's that good a politician. And as for the F1 teams, they're happier with the devil they know than the one they don't know. I'm not so sure the F1 teams will remain happy, Journeyer. There has been some muttering about a USGP from the manufacturers and the profitability of F1 concerns them less than their own markets. Sooner or later Bernie will have to bow to the pressure. But I do agree that we're stuck with him for the foreseeable future.